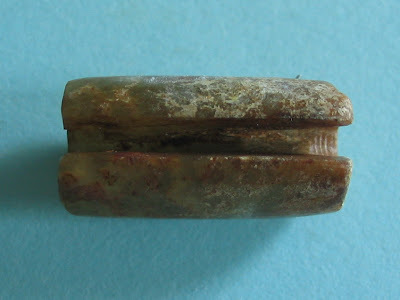 This Slit-tube artefact measuring 2cm long is also a Jue. 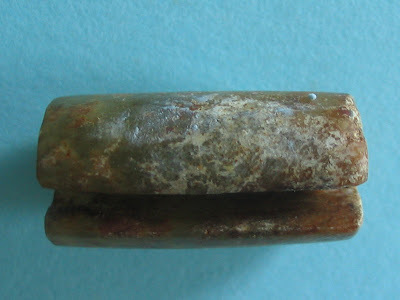 According to a Chinese source (Chinese jadeware: picture reference dictionary p.061) slit-tube as well as slit-ring jues were in existence in the Chahai Culture, around 5000BC. 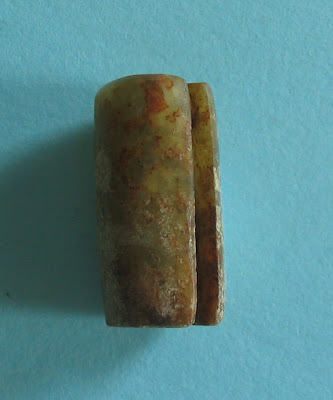 However, J Rawson in " Chinese jade: from the Neolith" says that "The earliest jue, which are more like slit-tubes than slit-rings, are found in the north-east in the Xinglongwa (about 5000 BC) and Chahai cultures (about 4500 BC), which preceded the Hongshan (about 3800-2700 BC)"
Although tube-shaped jues are described as probably ear ornaments by both the Chinese source as well as J Rawson I am at a loss to see how this slit-tube can be worn on the ear without falling off. These people from the Neolithic cultures sure have baffling ornaments. ! 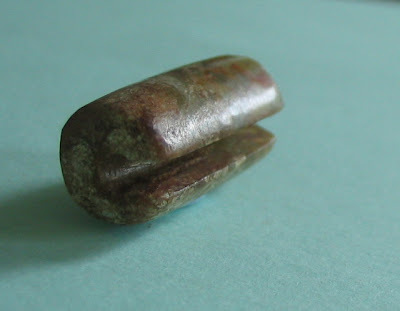 My specimen is plain with no embellishments and I am thinking that it may belong to some early neolithic culture. Jues (both tube-shaped and planar) from the later Warring states period have elaborate decorations of dragon, bird or cloud patterns on their surfaces. 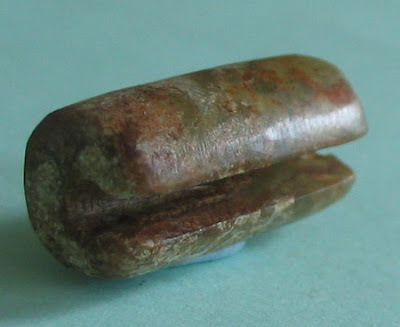 IMPO a slit-tube (jue) looks more like a bead that has been slit and a better name for it could be "slit-bead (jue)." ! 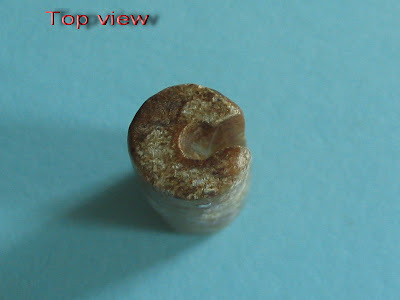 "Concentric-ring tool marks" are also present in the crevice of the slit-tube.